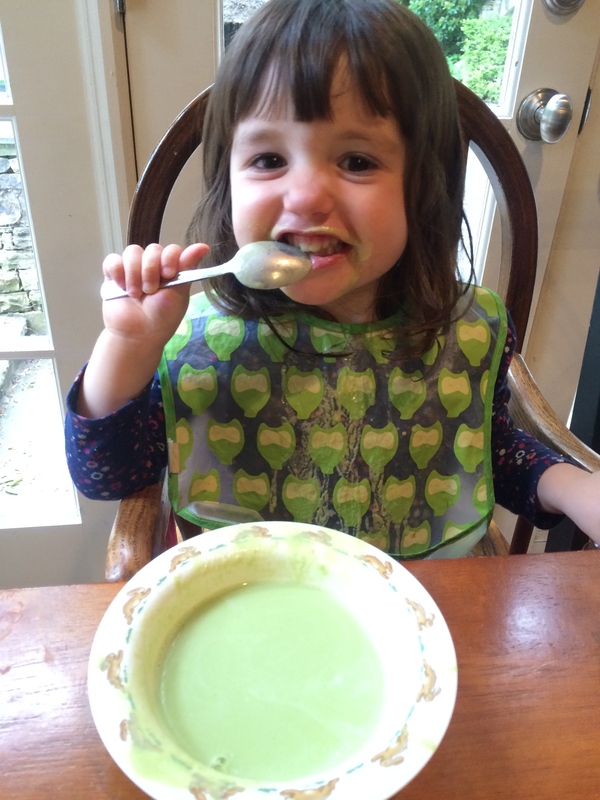 So I can (usually) get my kids to eat soup if it’s all blended together and they can’t actually see the vegetables and good stuff. This is a simple and popular version, with all the nutrients you need in one bowl. It’s smooth and full of flavour. Sometimes, they will even eat two or three bowlfuls. I am much more of a “throw in a handful of this and a handful of that into a pot” cook, than I am a methodical recipe-follower. I have tried to provide a good template here, but for me, soup recipes are really just rough guides. I never make exactly the same soup twice. So there is plenty of room for improvisation. First, roast the vegetables. Peel and roughly chop the carrots and sweet potato, toss in some olive oil, sprinkle with a little salt, and spread onto a baking tray. Roast in a 400 F oven until they begin to brown (around 30 minutes). Meanwhile, chop the onion and garlic, and sauté in a pot (a Dutch oven works beautifully) in some olive oil over a low heat. I usually put the lid on to let the onions sweat and sweeten. After 10 minutes, or when the onions are soft, add the lentils and stir. Add the stock cube, salt, cumin, coriander, and turmeric. Add the water and coconut milk. Finally, add the roasted vegetables. Bring to a boil, then turn the heat as low as it will go. Simmer for 40 minutes or so, stirring occasionally (the lentils tend to stick to the bottom of the pot). Serve. And it might even taste better the next day. This cake not only contains a large helping of good-for-you sweet potatoes, but it also doesn’t have much bad-for-you stuff either. No oil or butter, and not much sugar either! It’s wholegrain and vegan. Not quite guilt-free, but I don’t mind letting the kids have seconds. And did I mention: it tastes decadent and delicious? Oh, and the frosting is made with sweet potatoes, too. The recipe is just very slightly adapted here from Plant-Powered Kitchen. Preheat oven to 180 C or 350 F. To make a cake, grease the sides of a 9-inch cake pan (coconut oil works well) and line the bottom with baking paper. For cupcakes, put cupcake liners in your pan. Place your cooked sweet potatoes into a blender or food processor, along with the water, maple syrup, balsamic vinegar and vanilla until it is really smooth. In a large bowl, combine the flour, sugar, salt, cocoa powder, baking powder and baking soda. Add the chocolate chips. Mix the sweet potato mixture into the dry ingredients and just until combined. Put into the cake pan or cupcake pan and bake. About 22 minutes for the cake and 18 minutes for the cupcakes. Makes about nine cupcakes and a fairly thin layer cake. If you want a more traditional-sized cake, double the recipe and make two cakes, then layer them. This frosting is so yummy, yet not so heavy and sweet as traditional frosting. The main thing is to make sure it is really smooth. It would make a pretty tasty chocolate pudding that you could just eat with a spoon! This recipe makes more than two cups, so you’re likely to have enough leftover that you can do just that. Puree all the ingredients in a blender or food processor until very smooth. These little muffins never last long in our house. They aren’t very sweet, but have a nice zucchini-bread-like flavor, and are full of healthy ingredients, like zucchini (uh, I guess you figured that out already), quinoa and oats. And yes, there is chocolate! They are gluten-free, and could easily be made vegan by swapping ground flax seeds for the egg. This recipe comes from Sara Forte’s lovely book The Sprouted Kitchen. She has great snack ideas. In a bowl, whisk together the egg, vanilla, olive oil and maple syrup. In another bowl, stir together the quinoa flakes, oat flour, baking soda, baking powder, cocoa powder, cinnamon, salt, and the turbinado sugar. Squeeze the excess water from the shredded zucchini in a cheesecloth or with your hands (don’t be tempted to skip this step! ), and stir into the wet ingredients. Add the wet ingredients to the dry and stir to combine. The batter will be very moist. Cover and refrigerate for 30 minutes. While the batter is resting, preheat the oven to 375 degrees F.
Line mini muffin pan with paper liners. Using a cookie scoop, fill each muffin paper nearly to the top. Sprinkle with turbinado sugar. Bake for 18 minutes, or until a toothpick inserted in the middle comes out clean. Options: Sara Forte makes them on a cookie sheet like cookies, instead of as muffins. I have tried them both ways, and prefer muffins, but cookie-shaped is another possible way to do it. You can add 1/2 cup toasted walnuts to the batter if you prefer, but my boys won’t eat nuts, so I leave them out. To make them slightly more decadent, add some dark chocolate chips to the batter, or frost with cream cheese frosting. I have been making different versions of vegetarian burgers for years, and my mom has been making them for years before that. This is one my mom invented, which is probably the easiest and tastiest of them all. The millet gets a lovely crunchy texture when the burgers are fried. They are a crowd-pleaser. If you cook the millet ahead of time, this recipe comes together really quickly. Millet is an ancient seed, often described as a grain, that is mainly a starch. You cook it the same way you cook quinoa or brown rice. It contains no gluten. If it’s not in your local grocery store, try a health food store or buy online. These burgers also are vegan, and don’t use eggs to hold them together. The oats help to bind them, and while slightly crumbly they stay together remarkably well for being egg-free. First, cook the millet. (I usually do this a day or a meal ahead of time, and give the kids a bowl of cooked millet with butter, like I might give them rice, then use the rest for the burgers.) Cook 1/2 cup millet in 1 1/2 cups of water with 1/4 tsp salt until all the water is absorbed. If you pre-cooked your millet and it is now cold, heat it in the microwave so it is soft and moist before adding to the recipe. In a blender, mix the cashews, dried onion and garlic, chicken-style seasoning, soy sauce and water until smooth. In a bowl, mix the cooked millet and oats. Pour the blended mix over them. Stir in the crushed cornflakes. Mix well. Drop by spoonful (I use a stainless steel cookie dough scoop) onto a hot frying pan (I use cast iron) with a little oil for frying. Flatten the top, and flip over so that each side is browned. Serve immediately. They go great in a sandwich, or just on their own, next to a potato or sweet potato at dinner. My kids love mac n cheese just as much as anyone. And yes, sometimes they get the classic box with the scary orange powder cheese. (So easy to hand to a babysitter or DH!) But I have been attempting various forms of sneaky mac n cheese, with sauces made with cauliflower, cannellini beans, carrots and so on. One of the nicest ones I’ve tried comes from the Isa Does It vegan cookbook, using sunflower seeds as the main base for the sauce. It’s really creamy, and flavorful enough to please grownups too. This is also nut-free, so good for kids with allergies. And no cheese or butter! This recipe makes more sauce than you’ll need, so you’ll have extra to put on your veggies or maybe mix with your rice later. Or serve this delicious recipe again the next day! Submerge sunflower seeds in a bowl of water and soak for at least two hours, or overnight. Drain. Bring a large pot of salted water to boil, and then cook pasta according to package directions. Drain and return to the pot. Meanwhile, sauté the onions in the oil in a saucepan for about five minutes, then add the carrots and sauté at a medium low heat until they are slightly soft. Add the garlic and sauté for a minute more. Place the mixture in a blender or food processor. Add the broth, cornstarch, nutritional yeast, tomato paste, salt and sunflower seeds. Blend until very smooth. This could take a long time depending on the power of your blender. Transfer the sauce back to the saucepan. Turn the heat to medium and let cook, stirring often, until thickened. This should take about 15 minutes. Add the lemon juice and adjust the seasoning. Pour most of the sauce over the pasta. Mix it up and serve with a sprinkling of paprika over each bowl. Isa says she likes to add tons of steamed kale to the top, and pour more sauce over that! I have made this recipe probably more than 50 times, and I have yet to find anyone who doesn’t like it. Plus, it’s so simple you can have it on the table in minutes. It comes from my Aunt Karen, who is a healthy and imaginative cook, (and was making kale salad before I’d seen it anywhere else). The cashews give it a rich, creamy flavor, and the peas make the soup taste nice and fresh. Perfect for springtime. I made it for dinner tonight! Boil 1 cup of water in a pot on the stove. Add peas to the boiling water, and quickly bring to a second boil and cook for about 2 more minutes. Meanwhile, add cashews and a small amount of the 3 cups of water (maybe 1/8 of a cup) to a strong blender. Blend until smooth. Add the partially cooked peas (including the cooking water). Add the remaining ingredients and blend. Finally, add the remaining water until the mixture is creamy and smooth. Pour back into the pot and heat gently, but don’t cook further. Serve immediately. Note: If you use a bit less water for a thicker soup, decrease the salt proportionally. When I made these yesterday — almost 40 mini muffins — my three kids and niece ate all but three of them in about 30 minutes. They couldn’t believe I kept letting them have more, but they are pretty healthy, so. . . This recipe comes from the vegan Forks Over Knives cookbook, and the dessert section is by Isa Chandra Moskowitz of Post Punk Kitchen fame. I’m really enjoying learning how to bake vegan, without butter or eggs. It’s not nearly as difficult as I had always assumed. Preheat the oven to 350. Put muffin liners into pan. ( I used a mini muffin pan, but you can also make regular-sized muffins.) You can use reusable silicone liners, or paper ones. In a medium bowl, sift together the flour, baking powder, baking soda, salt, cinnamon and sugar. Make a well in the center of the mixture and add the mashed banana, milk, applesauce and vanilla. Stir together the wet ingredients in the well. Then mix the dry ingredients into the wet ingredients until just mixed. (Do not overmix.) Fold in the quinoa. Fill each muffin cup to the top. Bake for about 12 minutes (22 minutes for a regular-sized muffin) or until a toothpick inserted into the middle comes out clean. Serve. Put a few aside for yourself before the kids gobble them all up!